Dedicated to our Brother Todd Whitaker who we miss every day. 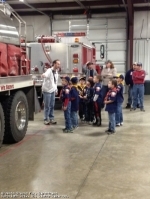 Chief Cory White had the opportunity today to teach fire safety to 10 Boy Scouts for their Fire Safety Merit Badge. Battalion Chief Phil Kimler, Firefighter Derek Miller & Firefighter Nathan Tolbert assisted in the afternoon at the firehouse. 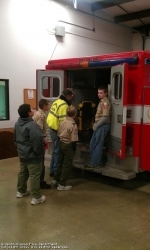 Chief Cory White & Battalion Chief Phil Kimler had the opportunity to give 10 Cub Scouts a tour of the firehouse and also take a ride in a firetruck tonight. Members of the AOFPD took the MABAS 46 tent trailer today to Monticello to train with the MABAS 28 tent trailer. This was the first time we had set it up and we want to thank the members of MABAS 28 for thier time with us. Members of the AOFPD spent the day in Argenta at the Safety Day. We had several units on display and cut up a car as a demo of what we do during a car accident. Argenta burn day's are Monday thru Saturday sun up till sun down no burning allowed on Sundays. Oreana Burn Days 7 days a week sun up till sun down. In both Villages you can only burn what grows in your yard such as leaves, branches, grass, etc. If you are interested in renting the meeting rooms at either firehouse please contact Don Long 619-2335. We do charge $50 for up to 4 hours and $100 for the day. This site has been viewed 294,279 times.